Today is a big day for the Chinese manufacturer OnePlus as it is marking its one year anniversary. In that short period of time the OnePlus team has brought us an amazing flagship smartphone - the OnePlus One and has been hard at work improving it ever since. To celebrate the occasion the company is offering a few interesting promotions that are definitely worth checking out. The market stirring One handset is now available to purchase without and invitation in both Sandstone Black and Silk White. Granted the device has been available on various online stores, including eBay's daily deals listing for quite some time now, but now you can purchase it straight from the folks over at OnePlus. The promotion will most probably last until the end of the day, so you better hurry if you wish to grab one. Today also comes with the announcement of OnePlus's own power bank. The unit will have a capacity of 10,000 mAh and should be available early 2015. The OnePlus Power Bank will come in the same two color options as the smartphone and with a price tag of $14.99. The company is also hosting a promotional event on both Vine and YouTube. 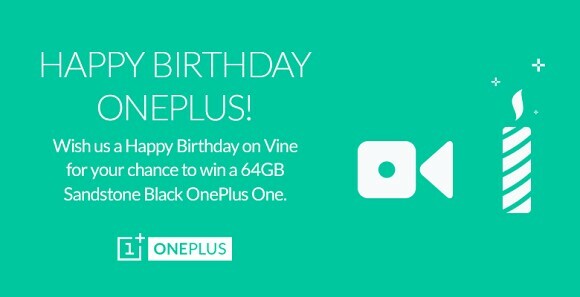 A commemorative video covering the company's progress during the last 365 days can be found on YouTube and you can also win a OnePlus One is you wish the guys over at Hong Kong a happy birthday on their Vine page. Another contest is also under way. The OnePlus team has been working hard on their own custom ROM. We should be hearing more about it next year. But for now it is in need of a proper name. So if you go on to their forum and contribute an awesome name you have the chance to win a once in a life time experience, organized by the manufacturer - a trip to Hong Kong as well as a complimentary smartphone and a power bank. What and offer! ""many many happy returns of the day ""